High-quality products and case-oriented engineering have always been Herbert Hänchen's forte. When looking for the perfect solution for your application case, you benefit from the know-how Hänchen has acquired in the fields of hydraulic drives, automation systems, and machine elements. We offer the complete service package: consulting, engineering, realization, and commissioning. Decades of experience distinguish the Hänchen engineering team. We'll find the right solution - for every application case! Hänchen builds high-quality hydraulic cylinders for every field of application. Our cylinders' quality characteristics in a nutshell: high control accuracy, long service life, low-maintenance, low-friction, robust, and a compact construction. 80 % vertical integration. 100 % made in Germany. 100 % quality. Hänchen builds special hydraulic cylinders for use in test machines. Test hydraulic actuators are perfect for highly dynamic industrial and testing tasks, such as material stress test stands for aircraft components. 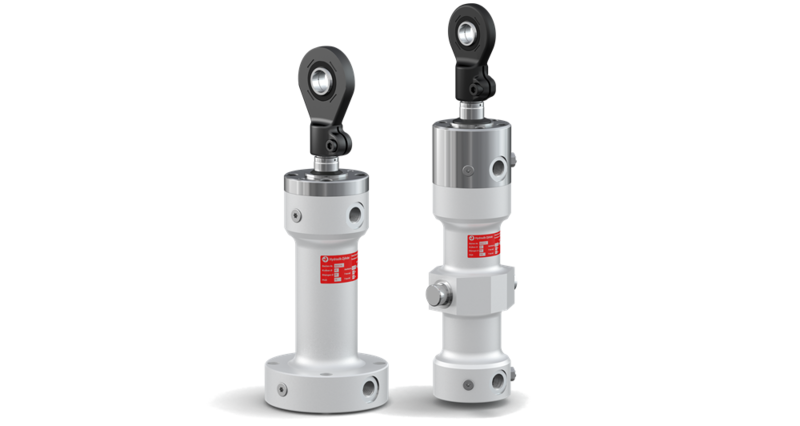 The working areas of these hydraulic cylinders are individually adjustable so that they can be perfectly adapted to your application. The advantage: low operating costs, higher energy efficiency. The patented clamping device Ratio-Clamp® holds the rod in a standstill and locks it into position mechanically. It is TÜV-certified and clamps down immediately, for unlimited periods of time, and without requiring any energy. 100% reliable! But also in multi-axle test stands for locking individual axles, or in ferries for locking the bow and stern doors. If necessary, we can also develop a customized solution for you. If certain processes require more or less force or a different fluid; pressure transducers and fluid transformers are a quick and cost-efficient solution. The secondary side can use almost all fluids, such as water, emulsions, or AdBlue. We design for you individual automation systems for your machines and systems. Our strength is the fact that we can match the drive system exactly to your requirements - based on substantiated technical consulting on engineering and project planning. Whether the drive is hydraulic or electric - we design exactly what works best for your application case. The modular structure of our drive system Ratio-Drive® allows individual solutions. You only buy the functions you need. Years of experience in constructing and manufacturing for special purpose machinery have also broadened our expertise in the field of machine elements. Our strength is your gain! Our production structure allows us to make unique single pieces or small batches. We can design individual machine elements for you, or manufacture them according to your engineering drawings. Developed by Hänchen, H-CFRP® is a high load capacity composite made of carbon fiber-reinforced and other components, refined to form a hybrid construction material. communicative, you get the exact data sheets immediately, and you can request 3D-CAD data or a quote based directly on your configuration. user-friendly, you are flexible in your configuration and can change any characteristic at any time; more than 1,000,000 product variants are available. consulting, design assistants and calculation diagrams for hydraulic cylinders and test cylinders are available, and you will get the necessary technical information for every characteristic you define with a single click. The Servoseal® is a dynamically sealing synthetic ring. The integrated retaining ring made of H-CFRP® prevents excessive pressure build-up on the sealing surface due to hydraulic pressure. At small amplitudes, no wear and no scoring is produced on the counterfaces due to lack of lubrication, which conventional seals tend to do. 100 % made in Germany. 100 % quality. The high surface quality and geometrical accuracy of the component parts of every single Hänchen product guarantee a long service life without failure. In our certified company we create sustainable and future- oriented drive solutions.